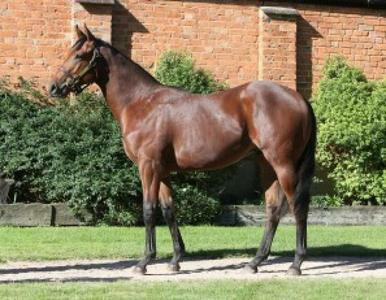 MAKFI (GB) (Bay 2007-Stud GB 2011, NZ 2011). 4 wins-1 at 2-at 7f, 1m, The Two Thousand Guineas, Gr.1. Sire of 201 rnrs, 110 wnrs, inc. SW Make Believe (Longchamp Poule d'Essai des Poulains, Gr.1), Maimara, Cornwallville, Noor Al Hawa, SP Return of the Mak - Beauty Flare (H.K. ), Astrelle, Moderah, etc. His oldest NZ-bred progeny are 3YOs and inc SW Marky Mark (Manawatu Sires' Produce S., Gr.1), Sofia Rosa, Hursley, SP Massa Lu, Miss Fi and of McPhoebe, Imposing Lass, Lucky and Healthy, etc. SABRATAH (f. by Oasis Dream). 6 wins-2 at 2-at 1100m, 1200m, €122,900, Chantilly Prix de Bonneval, L, Fontainebleau Prix Cor de Chasse, L, Maisons-Laffitte Prix Arreau, 3d Maisons-Laffitte Prix de Seine-Et-Oise, Gr.3, Deauville Prix Etalon Aqlaam, Maisons-Laffitte Prix Le Pacha. Azzuri. 2 wins at 10¼f, 1½m in 2015, 2d Kempton Adonis Juvenile Hurdle, 3d Aintree Betfred Anniversary 4YO Juvenile Hurdle. Raw Impulse (c. by Makfi). 2 wins. See below. International Love (f. by Manduro). 2 wins at 2000m, 2500m, Maisons-Laffitte Prix Flying Dutchman. Enville. Winner at 2000m in 2015, Milan Premio Niemet, 2d Milan Premio San Bernardino, Premio Mita, 3d Milan Premio Argelmo. Footstepsinbronze. 3 wins from 6½f to 8½f to 2015, Del Mar Allowance. Zawiyah (f. by Invincible Spirit). Placed at 2 in GB. Deepika. 10 wins from 3200m to 3900m, €109,160, £315, to 2015 in France. One Class Act. 2 wins at 2300m, 3400m in France. BEST OF THE BESTS (Machiavellian). Third Top Colt on The 2000 Irish 3YO Free H. 5 wins-1 at 2-from 1400m to 2000m, £204,730, €222,914, 360,000fr., 420,000Dhs in GB, France and U.A.E, Longchamp Prix d'Ispahan, Gr.1, Deauville Prix Guillaume d'Ornano, Gr.2, Sandown Solario S., Gr.3, Nad al Sheba Sheikh Maktoum bin Rashid al Maktoum Challenge No2, Gr.3, Sheikh Maktoum bin Rashid al Maktoum Challenge #2, L, 2d Ascot Royal Lodge S., Gr.2, 3d Ascot Queen Elizabeth II S., Gr.1, Leopardstown Irish Champion S., Gr.1-twice, Deauville Prix Jacques Le Marois, Gr.1, York Dante S., Gr.2, Doncaster Silver Jubilee S., 4th The Derby, Gr.1, Longchamp Grand Prix de Paris, Gr.1. Sire. SELL OUT (Act One). 3 wins-1 at 2-from 1400m to 2400m, Chantilly Prix des Tourelles, L, Newbury London Irish at Madjeski Stadium H., 2d Newcastle Hoppings S., L, Salisbury Upavon S., L, 3d Newbury St Simon S., Gr.3, 4th Newbury Geoffrey Freer S., Gr.3, Newmarket Severals S., L. Producer. MARIKA (Marju). 2 wins. See above. DIMBOOLA - NITTAN'S SPIRIT (Mac.) (Averti). 7 wins-1 at 2-to 1500m in GB and Macau, Macau Autumn Trophy, L, Guarda H., 2d Macau Oakbank H., Berrigan H., 3d Macau Derby Trial, L, Macau Sprint Trophy, L, 4th Macau Chairman's Challenge Cup, L.
SHAANMER (Darshaan). 3 wins at 2, €194,102, 394,000fr., US$9,600, Longchamp Prix des Chenes, Gr.3, Prix des Aigles, Deauville Prix d'Etreham, 2d Chantilly Prix Jean Prat, Gr.1, Longchamp Grand Prix de Paris, Gr.1, Deauville Prix Guillaume d'Ornano, Gr.2, Longchamp Prix du Prince d'Orange, Gr.3, 4th Longchamp Poule d'Essai des Poulains, Gr.1. Sire. NORDICAN INCH (Inchinor). 4 wins from 1600m to 1800m, Rockingham Spicy Living Sweepstakes H., L, 2d Belmont Garden City H., Gr.1, Woodbine Canadian H., Gr.2, Deauville Prix de Psyche, Gr.3, Monmouth Politely S., L, Toulouse Prix Caravelle, L, Derby du Languedoc, L. Producer. Race Record: 6 Starts 2-2-1 £10,504, A$27,500. 2 wins at 1500m, 2050m to 2015-16, MVRC Adapt Australia H., 2d Newmarket NGK Spark Plugs H., 3d Goodwood Whiteley Clinic S.